Hi-Rez Studios today announced that its free-to-play MOBA SMITE, the mythology-themed third-person action game, has officially launched on Xbox One. 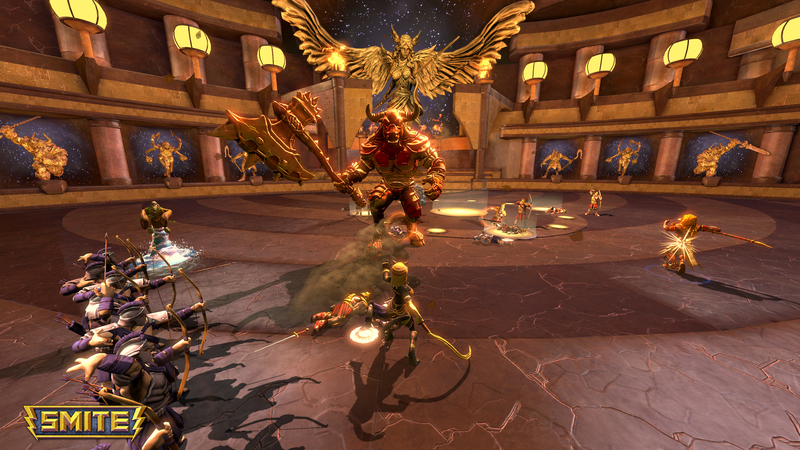 During the game’s alpha and beta testing SMITE amassed over 1 million unique players. Newcomers can now access the complete SMITE experience directly via Xbox Live. “With over one million participants in our beta, there is clearly an appetite for the right MOBA on console. MOBAs have historically been a PC-only genre, but SMITE’s action oriented gameplay is a great fit with the Xbox One controller. The strong player retention we’ve seen during beta makes us confident that this is just the beginning for console MOBAs and console eSports”, said Todd Harris, co-founder and COO of Hi-Rez Studios. Additionally, SMITE will hold its first Xbox One tournament at the Major League Gaming World Finals from Oct. 16-18 in New Orleans, USA. Teams will compete for a spot in the MLG Pro League, as well as a $25,000 prize. The MLG Pro League consists of 6-8 teams, one of which will qualify for the SMITE World Championship from Jan. 7-10 at the Cobb Energy Performing Arts Centre in Atlanta, Ga. The SWC 2016, which will conclude Season 2 of SMITE for both Xbox One and PC, has already surpassed its $1,000,000 prize pool through season ticket sales. All further proceeds will go toward funding additional SMITE tournament prize pools throughout the season. SMITE’s in-game marketplace allows players to acquire new gods, cosmetic skins and more on Xbox One, and those who link their PC and Xbox One accounts will receive a free Zeus Xbox skin for use with both platforms. Additionally, players can still purchase the SMITE Founder’s Pack for 29.99 EUR/23.99 GBP through the Xbox Games Store until Aug. 31. It includes every god currently in the game (66 so far on Xbox One) and all future gods, 400 Gems, the exclusive Ares “Soldier of Fortune” skin, and the limited Ymir “Cacodemon X” skin. A one-time account merge option lets players copy select progress and items from their PC account to Xbox One until Aug. 31.